• A versatile, multi-purpose matwell system suitable for casting in. 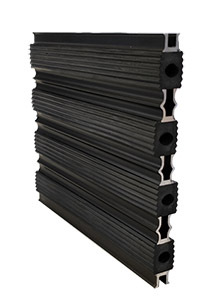 • Package system pre-cut and mitred with corner stakes available. 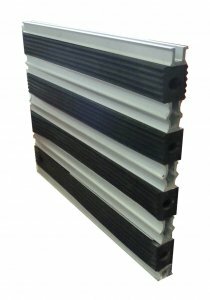 • Suitable for 12mm or 17mm matt thickness. • Easily transported and assembled on site. • Internal and external corners are easily accommodated. • Designed for economy and simplicity of installation. 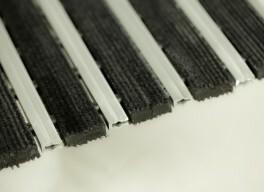 External Matting: The plain rubber design is recommended for external and high U.V. exposed areas. 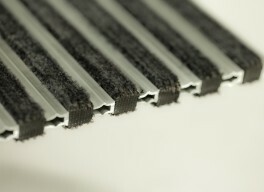 Internal Matting: The coloured wiper strips are most suited to internal, low U.V exposure locations, as with normal floor coverings. 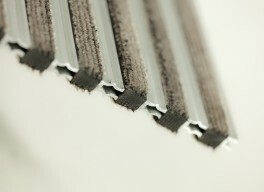 Buffed natural grey wiper strips with Aluminium scraper bars. Black anodised aluminium scraper bars. DuraGuard, 12 mm, module 1. 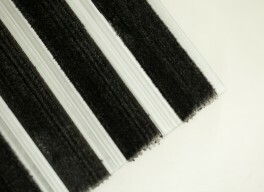 Buffed wiper strips in standard colour range with Aluminium scraper bars. 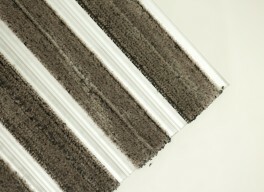 Nuway, the name synonymous with high quality entrance flooring systems. Wherever you see the Nuway mark you can be assured of true performance. Nuway has been the forefront of specialist entrance flooring technology for over 80 years and is committed to long term development, providing innovative, state of the art products to meet market and customers needs. 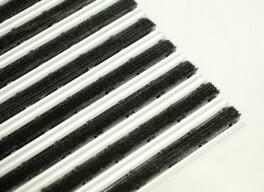 Each product within the range had a unique design, specifically engineered to reduce soiling at the point of entry. 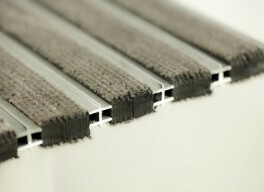 Nuway Entrance Matting originated in Telford UK and has been in service throughout Australia for over 30 years! 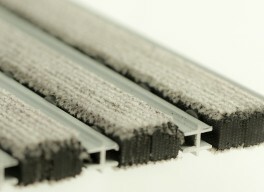 Due to its proven reputation and longevity it is now considered the hallmark of entrance matting. 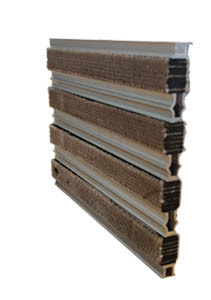 The Nuway Matting System is designed to remove both dirt and moisture that is commonly brought in underfoot, thus reducing both costly cleaning and un-due maintenance. 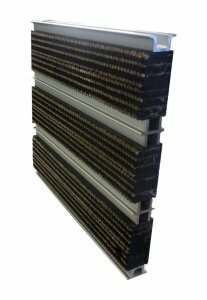 Many high traffic and prestigious buildings such as hotels, airports, healthcare centres and high-rise office buildings have had Nuway matting performing successfully for over 25 years. 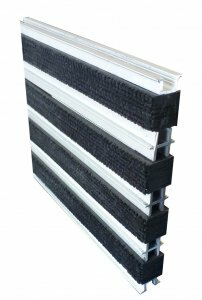 Nuway matwell frames are available in aluminium, and are designed to anchor into sand and cement screeds for secure site installation. All frames are custom built to fit specific site requirements, with curved shapes available to special order. 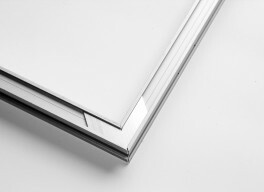 Nuway frames are supplied in kit form for ease of transport, storage and on-site assembly. 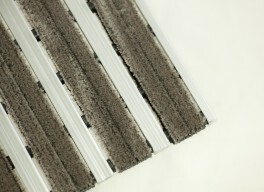 Nuway entrance flooring systems effectively stop dirt form entering a building. To maintain optimum performance, and for the warranty it is essential to regularly remove soiling to prevent the product from becoming saturated and lose its ability to perform. Detailed instructions are available on request. 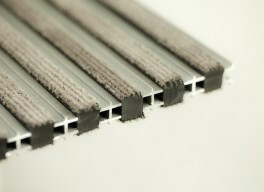 Internal and external ramp frames are supplied mitred. The surface is ribbed for enhanced grip. Nuway T-bars can be used to provide a surface mounted matwell frame, mitred and screwed to the existing floor surface where the adjoining floor covering is of sufficient thickness. Nuway T-bars also provide separation between modules to facilitate easy removal for cleaning, reversibility and as rib alignment is not possible in many installations.Available in aluminium, T-Bars are automatically included in each order as required. Nuway products can be provided in all shapes and all configurations. Nova products global can work from a template provided in consultations with our national team. Nuway’s Tuftiguard systems can be personalised with copy, logos, crests and messages. To maximise on capital outlay, considerations should be given in the planning stage to the design of the mat layout. A symmetrical design enables the use of regular size modules, which may be interchanged to maximise wear without the overall appearance of the mat changing. For example the outer edge modules can be “swapped” with the centre section modules, which may have more traffic passing over them. In Large multi-directional traffic installations, optimise the performance with the flexibility of Nuway Modular tiles. These can be configured to enable interchangeability and reversibility, for return on investment and appearance retention. The correct preparation is important to assure the durability and safety of Nuway products. 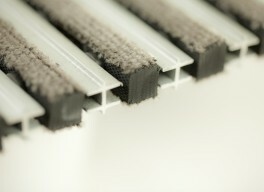 Nuway Matting Systems are able to provide details of our approved, network of trained distributors. These must be of sound construction, dry, smooth and level. 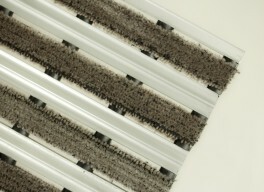 Prior to installation the surface should be clean and free from contamination. The screed should be flat and level to accommodate the depth of the chosen mat. Again the screed should be flat and levle to the depth of the frame, and thought must be given to drainage. PVC is temperatures sensitive. In areas where temperatures may increase, such as in glass atrium, beneath hot air blowers, in sunlit facing areas or within heat curtains, please contact Nova products Global on enquiries@novaproducts.com.au.